Aries Music Inc. Modular ad from page 30 of Contemporary Keyboard magazine August 1977. This 1/4 page ad was one of the earlier ads by Aries to run in CK, mostly during the summer and fall of 1977 before being replaced with a Phase/Flange module ad. I have to admit I'm not that familiar with Aries, but I'm always surprised at how memorable the ads are. I don't have to tell my regular readers that one of the reasons is that awesome Aries logo - most likely designed by then-resident designer Jennifer Morris. This wasn't their first logo, but it is a classic. But other than the logo, I don't know why I'm drawn into these ads. In fact, Aries ads confuse me a little. In some ads, like the one posted today, Aries is positioned as a maker of modular systems, competing directly with Moog, ARP and others. While in other ads, they only push one or two modules and stress the fact they are fully compatible with other major instrument manufacturers. To top it off, Aries was also trying to sell the modules in kit form like Paia did. Maybe Aries was trying to be a lot of different things to a lot of different people. Or maybe they didn't know what made themselves great yet and were still trying to find the niche that best fit. Who knows... . But either way, since they only had a quarter of a page to get their game on, they could really only choose one message to fit into that little space, hindering their ability to effectively stake their claim in all the different markets they were trying to compete in. I came across two great online resources for anyone interested in Aries. Definitely check 'em out. 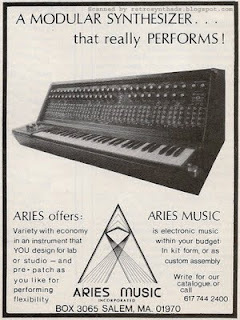 Robert Leiner's Aries Music page - an amazing collection of Aries history including brochures, ads, photos, modules, schematics. Kevin Kissinger's Aries page - lots of mp3s of music produced with his Aries modular.